If you engrave rubber stamp copy with a manual or computerized engraving machine, this is the board that you need. It is custom manufactured for us, to our specifications. It will withstand temperatures of 300 degrees F in the vulcanizer without warping or distorting. It is softer and easier to engrave than plastic based phenolics, reducing the likelihood of breaking the centers of small characters and prolonging cutter life. This board is 1/8" thick making it engravable on both sides for stamp copy. Three standard sheet sizes are offered or it can be provided in custom sizes to meet your special needs. Sheet sizes listed are approximate. 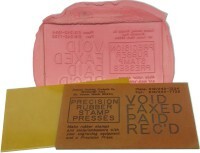 For Really Tough Stamping Applications!